Pathfinder Goldens was formed in the year 2006. We have been involved with dogs all of our lives, growing up with German Shepards, Poodles and one feisty Dachshund. Our love of goldens began in 1986 with the purchase of Oriana’s Destiny “Annie”. Our love for this wonderful breed grew and led us to where we are today. We are in good standing with the American Kennel Club and are members of the Yankee Golden Retriever Club, Mid Florida Golden Retreiver Club as well as the Golden Retriever Club of America. Learn more about this wonderful breed at www.GRCA.org Our kennel name is dedicated to my father who is a retired Colonel US Army. He started his career as a pilot and paratrooper. The term Pathfinder was used for the first soldiers out of the airplane whose job it was to explore and map the terrain. This term is also significant as we are learning and mapping our way into the “dog world”. 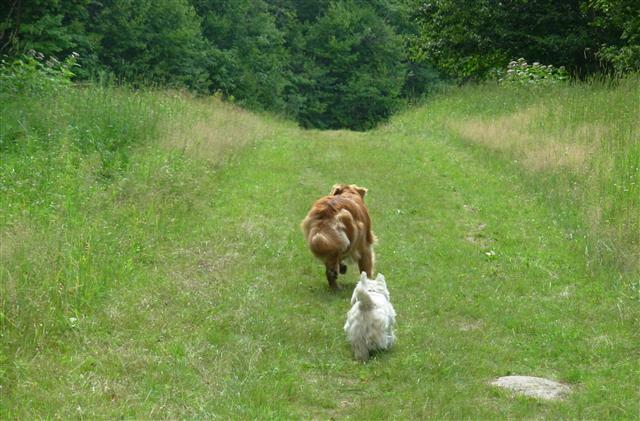 Our goldens, are directing us in a path that is turning out to be a wonderful journey.